Surrender leaflet: Meant for Confederate defenders of Vicksburg, Miss. 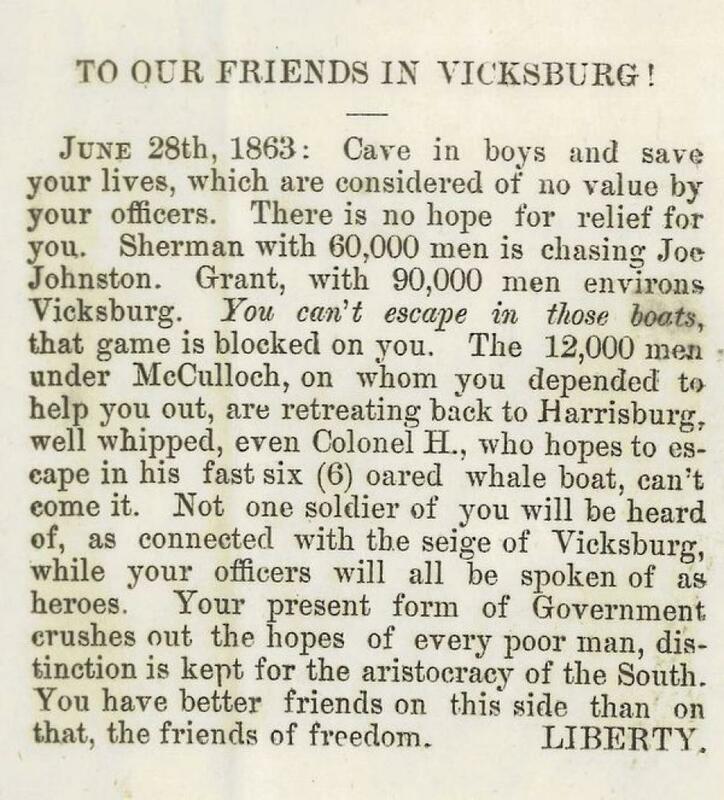 At the tail end of the siege of Vicksburg, Miss., which came to a close on July 4, 1863, a Union officer printed this leaflet, planning to get it into the hands of the embattled town’s remaining defenders. The leaflet, addressed to the enlisted men of the Confederate army, systematically dismantled their hopes for relief. Troops under Confederate officers Joseph Johnston and Henry Eustace McCulloch were unable to come to their rescue, its author argued. Grant’s troops around Vicksburg were 90,000 strong. Commodore [David Dixon] Porter got up [the circular] and attempted to transmit [it] in bombshells. Three hundred copies of these were placed in a shell, with the hope that out of this number perhaps one might be saved and picked up, but none ever arrived safely in town, and after the surrender an officer of Porter’s fleet handed me this copy and told me the story. Mariam Touba, reference librarian at the New-York Historical Society, which holds this copy of the leaflet, suggests that the circulars may also have been floated across the lines in balloons but adds that there’s no evidence any Confederate soldiers saw them. The leaflet drop is largely an invention of 20th-century psychological warfare. This Vicksburg example—ineffective though it may have been—was certainly ahead of its time. “To Our Friends in Vicksburg!” SY 1863 no. 1. The New-York Historical Society.